Scientists at the University of Chicago and Argonne National Laboratory have discovered a new way to precisely pattern nanomaterials, which could open a new path to the next generation of everyday electronic devices. The new research, reported in a paper in Science, is expected to make such materials easily available for eventual use in everything from LED displays to cellular phones to photodetectors and solar cells. Though nanomaterials are promising for future devices, ways to build them into complex structures have been limited and small-scale up to now. "This is a step needed to move quantum dots and many other nanomaterials from proof-of-concept experiments to real technology we can use," said co-author Dmitri Talapin, professor of chemistry at the University of Chicago and a scientist with the Center for Nanoscale Materials at Argonne. "It really expands our horizons." The foundation of modern computing is a tiny switch called a transistor, made billions at a time by a technique called photolithography. This process, which has made smartphones cheap and ubiquitous, carves a stencil out of a layer of light-sensitive organic polymer by laying down a patterned ‘mask’ and illuminating it with ultraviolet light. After new material is deposited on top, the polymer stencil is lifted off to reveal the pattern. Several rounds of such patterning build a miniature transistor onto the material. But the method has its limitations. Only a few materials can be patterned this way; it was originally developed for silicon, and as silicon's half-century reign over electronics reaches its end, scientists are looking ahead to the next generation of materials. One such avenue of interest is nanomaterials – tiny crystals of metals or semiconductors. At the nanoscale, these materials can have unique and useful properties, but manufacturing devices out of them has proved difficult. The new technique, termed DOLFIN, converts different nanomaterials directly into ‘ink’ in a process that bypasses the need to lay down a polymer stencil. Talapin and his team carefully designed chemical coatings that react with light for individual particles. These coatings ensure that, if light is shone through a patterned mask, the pattern is transferred directly into the layer of nanoparticles below – wiring them into useful devices. "We found the quality of the patterns was comparable to those made with state-of-the-art techniques," said lead author Yuanyuan Wang, postdoctoral researcher at the University of Chicago. "It can be used with a wide range of materials, including semiconductors, metals, oxides or magnetic materials – all commonly used in electronics manufacturing." 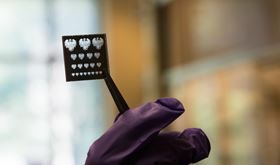 This shows a 'mask' or stencil for patterning nanomaterials using a new process that promises to make them far easier to incorporate into LEDs, solar cells, transistors and other electronics. Photo: University of Chicago.